The Grumman A-6 Intruder first flew in 1960 and was delivered to the Navy in 1963 and the Marine Corps in 1964. This airplane was flown in Vietnam and the 1991 Desert Storm campaign. The Navy's experience in the Korean War showed the need for a new long-range strike aircraft with high subsonic performance at very low altitude--an aircraft that could penetrate enemy defenses and find and destroy small targets in any weather. The Grumman A-6 Intruder was designed with these needs in mind. The Intruder first flew in 1960 and was delivered to the Navy in 1963 and the Marine Corps in 1964. The Navy accepted this airplane as an "A" model in 1968. It served under harsh combat conditions in the skies over Vietnam and is a veteran of the 1991 Desert Storm campaign, when it flew missions during the first 72 hours of the war. It has accumulated more than 7,500 flying hours, over 6,500 landings, 767 carrier landings, and 712 catapult launches. The Navy's experience in the Korean War showed the need for a new long-range strike aircraft with a high subsonic performance at tree-top height to permit under-the-radar penetration of enemy defenses and to be capable of finding and hitting small targets in any weather. The outcome was the Grumman A-6 "Intruder". Manned by a pilot and bombardier/navigator seated side-by-side, the A-6 twin-engined design increased reliability and delivered superior performance to other single-engine designs. Initial orders for the A-6A were placed in March 1959 for eight YA22F-1 development aircraft. The first one flew on April 19, 1960, and the remaining seven quickly followed. The first A-6As were delivered to the Navy in 1963 and to the Marines in 1964. The first operational squadron to receive the them was VA-75, and began supporting US forces in Vietnam flying off of the carrier USS Independence and remained heavily engaged for the duration of the conflict. The Digital Integrated Attack and Navigation Equipment (DIANE) and its subsystems incorporated into the aircraft enabled the crew to attack preselected targets at night or under adverse weather conditions without having to look out of the cockpit during the mission (from launch to recovery). On May 23, 1966, an A-6 fitted with a hose and drogue-refueling apparatus made its first flight to demonstrate that a "tanker" version of the jet was feasible. As A-6 aircraft were produced -- from the -6A through the -6E -- developments in sophisticated electronics and delivery hardware were incorporated to include Low Light Level TV (LLLTV), Forward Looking Infrared (FLIR), laser targeting, and Moving Target Identification (MTI). Properly used, Intruders were capable of delivering highly effective aerial attacks. For example, two A-6s made a night strike with 26,500 lb. Bomb loads against a power plant in North Vietnam. The Vietnamese were convinced that B-52 bombers had been at work. A Navy Cross was awarded for that mission. Succeeding the A-6A in production, the A-6E first flew in February 1970, in the form of a modified A-6A. The new model, featuring an updated avionics suite, airborne radar set, and navigational computer, entered service with the VA-42 training unit in 1971, and with VA-85 as the first operational unit in December that year. After fatigue problems were discovered in the A-6E fleet, a new wing of graphite/epoxy construction was developed and flown by 1987. In addition to the new composite wing, these aircraft also were fitted with a digital armament system and a standoff weapons capability under the systems weapons integration program (SWIP). Subsequent to Vietnam, equally effective all-weather strikes were made by A-6s against targets in Libya during the Gulf of Sidra crisis, Iranian gun boats in the Persian Gulf, and Iraqi installations during Desert Storm operations. The last of the A-6E Intruders were retired in 1997 although the EA-6B "Prowler" variants are still in service. 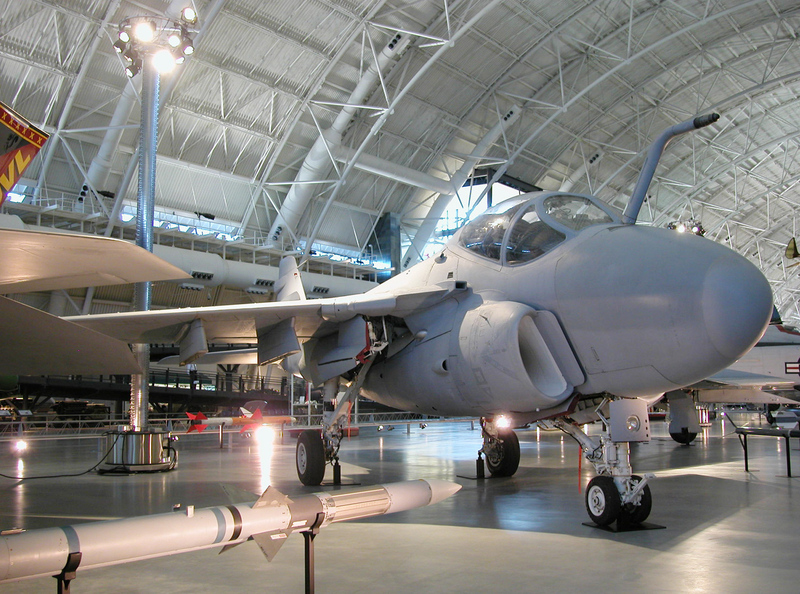 NASM's Intruder aircraft was accepted by the U. S. Navy on March 5, 1968 at the Grumman plant on Long Island and flown to NAS Whidbey Island, Washington. The aircraft had served under harsh combat conditions by day and by night over Vietnam. This aircraft was also a veteran of Desert Storm and flew missions during the first 72 hours of that war. During its flying career, it had accumulated more than 7,500 flying hours, more than 6,500 landings, 767 carrier landings, and 712 catapult launches. BuNo 154167. Conventional all-metal, graphite/epoxy wing (retrofit), aluminium control surfaces, titanium high-strength fittings (wing-fold). Dual place (side by side), twin-engine, all-weather attack aircraft; multiple variants.